Just Thinking....: What's In A Name? Try saying this title three times straight without messing up. It's much easier to write about. I wasn't sure about reading this one and I am SO glad I decided to give it a try. I read it pretty much straight through stopping only for what was necessary. (feeding kids, bathroom -stuff like that) I just HAD to see what happened next. I am thrilled that I have found this author. 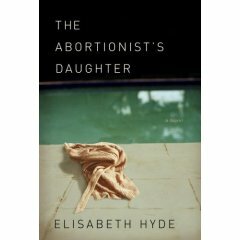 I'm not usually one for a murder mystery element but with The Abortionist's Daughter it works. The dialogue moves the book along and the very though provoking situations enrich the reading experience. Put this one on your TBR list!